I'm about to say something that may shun me from the U.K. forever... but I'm not the biggest fan of Indian food. Now before you start throwing things at me, hear me out. I don't dislike the food, if I have Indian food I do tend to enjoy it, but I just never crave or want it. If I get a takeaway it's 50% of the time going to be pizza and the other 50% of the time Chinese food. But when I was contacted and invited to try out the Raj restaurant in Blackhall, I decided to give it another go. As a single lady, I alternate bringing my pals along with me to meals, and I had the right friend in mind. My friend Annie knew the Raj restaurant when it was originally in Leith and really enjoyed it, which made me super excited to try it out. They relocated to Blackhall after 30 years in Leith, so it is a well-loved restaurant. If you've been looking for it, it's moved to a slightly less convenient (in my opinion of course) location on Hillhouse Road. So let's get down to the good stuff... the food! It's been a long time since I've had Indian food so we had to go all out and have the full meal, that of course starts off with papadums. We ordered a few papadums along with a chutney tray to go with it. I forgot how much I do like papadums, so I really enjoyed them. My favourite chutney from the tray was an interesting spiced apple one. 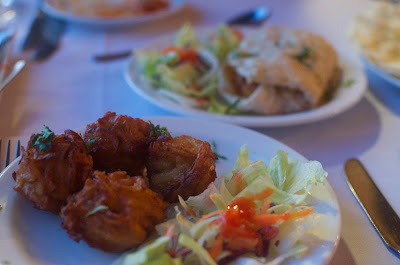 Next came our starters which we shared; crispy vegetable pakora (which were a bargain price of £2.95 by the way!) and king prawn puri. 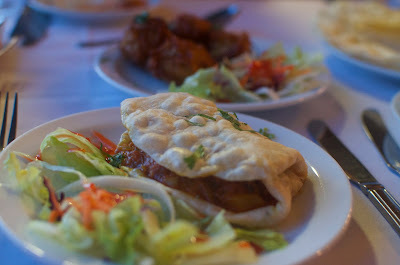 The pakora made of potato and onion was very nice but the king prawn puri stole the show for sure! Annie said that this was the dish she used to order when the Raj was in Leith and she always looks for it at other restaurants but can't always find it. The prawns were in a tangy and spicy, but definitely not too spicy, sauce and wrapped in puffed fried bread. Finally it was on to the mains... and naan of course. We again shared everything and feasted on a chicken passanda curry, tandoori king prawn, basmati rice and a garlic and coriander naan. 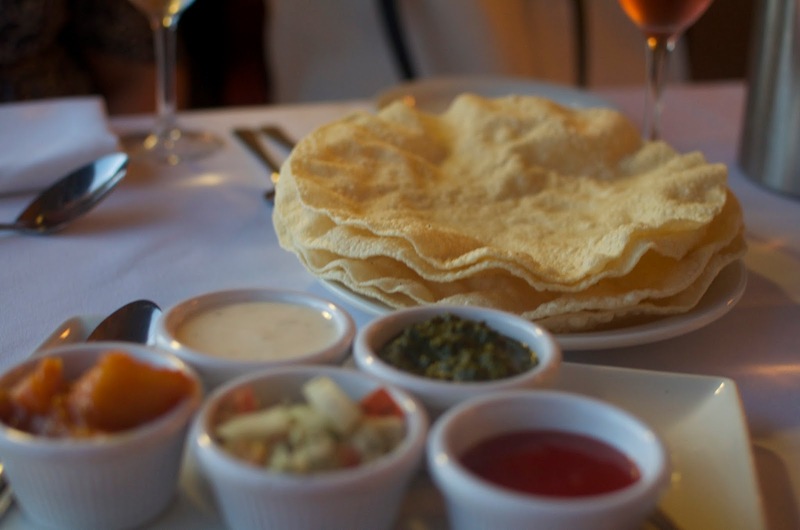 The portion sizes at the Raj are very reasonable, which means you can have the full big meal of papadum, starter, curry, rice and naan without feeling like you're going to be sick. When I do eat Indian food, passanda is the curry I look out for, it's creamy and a little sweet with added almonds, right up my street. Traditionalists will find all their favourite curries on the Raj's menu from your Vindaloo's to your Madras to your Balthi. The tandoori king prawns were a little disappointing as they were a bit overdone, but the accompanying sauce was really delicious. The naan was great, and not too much coriander for those coriander-phobics. The service at the Raj was really stand-out. The staff are super attentive and friendly, it is one of those restaurants that has a warm, homey feeling. After your meal they bring along a complimentary traditional pudding as well as a digestif of either tea, coffee or a liqueur (I had a cheeky Bailey's), which is a really lovely touch. From vegetarian dishes to seafood and meat, the menu is super long, so you're guaranteed to keep everyone happy (and the wine's affordable so if not... get everyone tipsy!). The food in general is also really reasonably priced, so you can eat to your heart's content without worrying about spending too much. They also do a really affordable buffet on a Monday evening and all day Sunday! While it may not have fully converted me to ordering an Indian instead of a Chinese on a hungover Sunday, I really enjoyed my meal and experience at the Raj restaurant. I definitely plan on bringing a bunch of my friends for a buffet Sunday at some point, maybe a buffet will help me be a bit more daring and try some new curries. Check out their website for more information and to have a peak at their menu. Disclaimer: I was kindly invited to review the Raj but this post, as with all my posts, reflects my own views and opinion.